I really love my Darn Tough socks. I have been promoting them to my friends and family for years. I even converted my sons. There are several reasons why I like them. They are, indeed, darn tough. They are very comfortable. The fabric fights odors. They are made in America. And I love, love, love the lifetime guarantee. Twice I have had to return a pair because of a small hole in the toe. Both times, the company sent me a new pair right away, no questions asked. But now I have a dilemma. 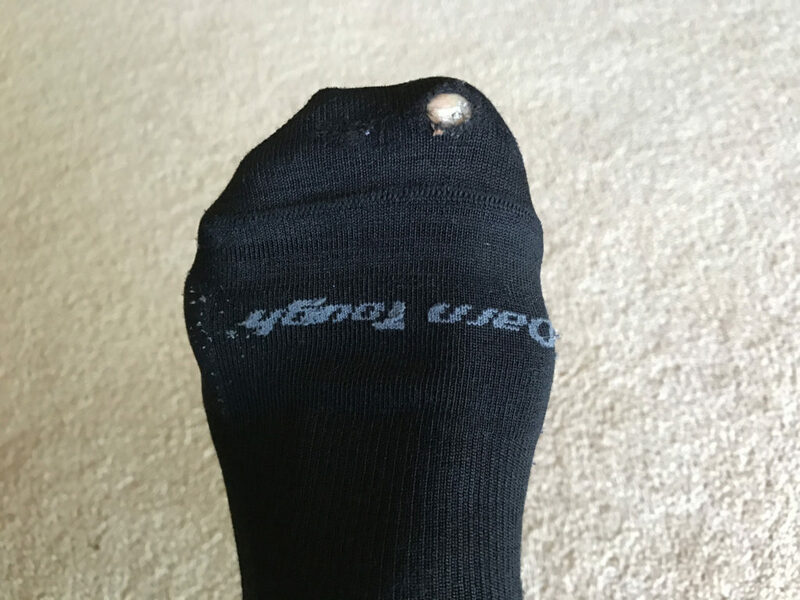 Another sock has developed a hole in the same place as the other two times. I have to face the reality that the problem is not with the sock, but with my toenail. It’s too much of a coincidence that three different socks would get holes in the same place. Three times, the socks have changed, but the foot hasn’t. The problem clearly isn’t with the sock. I have a toenail problem. With a sigh, she places the envelope in her “Out” tray. She is sad to be pouring good money after bad. The lifetime guarantee is killing the company. It would be better for everyone if the company simply refunded Toenail Guy’s money and washed their hands of him. But a commitment has been made, and Nancy, a good soldier, will honor that commitment. After all, even though Toenail Guy is a drain on corporate profits, at least he knows that the problem is with him. And this can’t go on forever, can it? How long can a guy live, with toenails that bad? Nancy nods, sadly. Some days, her job tests her faith in humanity.